As a regular podcaster of US radio programs such as NPR’s Wait Wait Don’t Tell Me and KCRW Le Show by Harry Shearer, I have heard a lot about New York State Attorney and Governor of New York, Eliot Spitzer. His downfall inspired much humour – here was a man who held himself up to be a moral crusader, who challenged the dodgy practices of Wall Street firms long before most of us saw the financial crisis coming, and he was caught frequenting the services of prostitutes. Once this was revealed in the press, he resigned and has struggled to find another place in public life. But, the question raised by this documentary is was it the scandal that has caused his downfall, or is it something more sinister? The director of this film is Alex Gibney, who has made other documentaries such as Taxi to the Dark Side, Enron: The Smartest Guys in the Room and, also featuring the film festival, Magic Trip: Ken Kesey’s Search for a Kool Place. 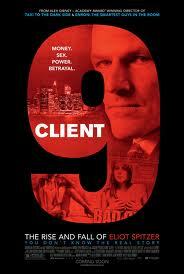 Client 9 has interviews with many of the key players of the scandal: pimps, prostitutes, politicians and business executives and it certainly paints a sordid tale. By the end, you are ready to believe the conspiracies that Spitzer was a man who man some stupid decisions but should not have been forced to pay such a high price.